Our lunch is usually a big mixed salad with a piece of chicken or baked fish. I usually make a batch of chicken during the weekend, so I can quickly make a healthy lunch during the week. All I need to do is prepare a salad and reheat a few pieces of chicken. 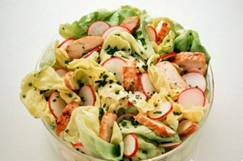 I have listed a few ideas for salads and a few of my home made easy chicken recipes. Reheat one or two pieces of chicken for 12 minutes on 325F for a quick lunch. Take the Costco organic chicken thighs out of the bags on paper towels to get them dry. Take a big skillet and heat 2 tbsp of olive oil for a few minutes on medium heat. Sear the chicken thighs in the oil in 2 batches, 4-5 minutes each side. Sprinkle each side with salt, pepper, turmeric, paprika, little curry, oregano. Remove the first batch into a casserole or dish and start the second batch. In the mean time, chop ½ red onion and a 1/4c kalamata olives. When the second batch of chicken is ready, sprinkle half of the vegetables on the second batch, then add the first batch of chicken on top and sprinkle the rest of the vegetables. Drizzle 3 tbsp of balsamic vinegar and 1/4c of red wine (wine optional, use a bit of water instead). Put a lid on the skillet and let the chicken simmer on low heat for about 20 min. Store in the refrigerator for an easy lunch. Take a big skillet and heat 2 tbsp of olive oil for a few minutes on medium heat. Sear the chicken thighs in the oil in 2 batches, 4-5 minutes each side. Sprinkle each side with salt, pepper, turmeric, paprika, little curry, thyme and oregano. Remove the first batch into a casserole or dish and start the second batch. In the mean time, chop ½ red onion, ½ paprika and 2 tomatoes. When the second batch of chicken is ready, sprinkle half of the vegetables on the second batch, then add the first batch of chicken on top and sprinkle the rest of the vegetables. Add some white wine if needed. Put a lid on the skillet and let the chicken simmer on low heat for about 20 min. Store in the refrigerator for an easy lunch. In a small bowl, make a marinade: add ½ tsp each of salt, black pepper, turmeric, paprika, ¼ tsp of curry, 1 tbsp of dried oregano. Add ¼ c of balsamic vinegar. Slowly poor and stir in ¼ c of olive oil until thickened. Add ½ c of dry red wine like cabernet sauvignon. Move chicken thighs from a 3 pack of Costco’s organic chicken thighs to a 1 quart ziplock bag. Poor the marinade over the chicken and close the bag. Massage the chicken to distribute the marinade evenly. Refrigerate for 2 – 8 hours. Warm up gas grill to 350F about 10 minutes. Grill chicken on medium-low heat about 7-8 minutes per side. Poor the marinade on the chicken after turning. Turn over again before removing them from the grill. Store in glass or ceramic container in the refrigerator and reheat what you need for your lunch. In a small bowl, make a marinade: add ½ tsp each of salt, black pepper, turmeric, paprika, red pepper flakes, 1 tbsp of dried oregano, 2 minced garlic cloves. Add juice of 2 lemons. Slowly poor and stir in ¼ c of olive oil until thickened. If not enough fluid, add white balsamic or white wine vinegar.